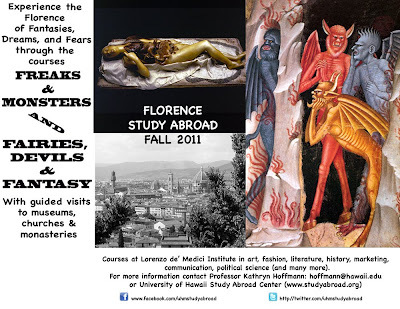 Friend of Morbid Anatomy Kathryn Hoffmann of the University of Hawaii, Manoa has just announced that she will be leading a "Freaks, Monsters, and Fairies, Devils, and Fantasy" tour of Florence, Italy this upcoming fall semester. The tour will take in, in Hoffman's own words, "wax anatomical models of course, as well as the devils of Florence, reliquaries, the history of court and fairground stars with corporeal anomalies, and the original dark version of Pinocchio, where he came to a sad end in Book 5. I'm going to teach and take students out of the classroom and into the museums and churches." Applications are due on April 1; for more information, email professor Hoffman at hoffmann [at] hawaii.edu. So wish I could make it! Please click on the image to see a much larger version.